If done right (which you did) black can look very nice. Subtle tasteful graphics. Looks like a stealth fighter ready for MX. Surprising that someone would pull the 01 engine out and replace with an older HPP one. I have an 01 myself. I wish these bikes were still available. Nice exhaust. Did you cut the grip tape on the frame yourself? Looks good. Very nice. I bet that translucent tank was tough to find. Man. Can't compliment that bike enough. 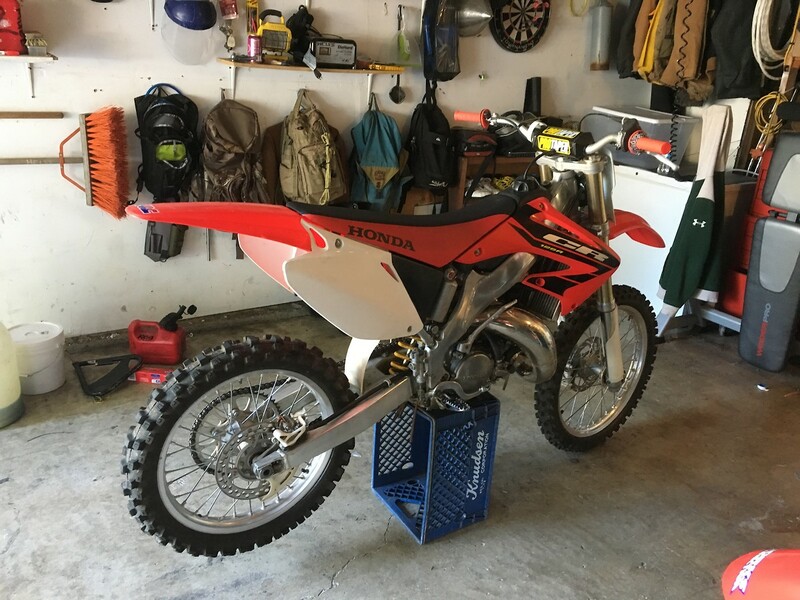 My kid bought a kit for his 04 CR 125. THANKFULLY he's gotta ride it. Not me. Now I just leave him behind to avoid the embarrassment. Stock looked way better. V Force reeds made a difference on my 01. Motostuff oversize front brake kit and a revalve and spring the suspension. Made the bike seem more planted. I'm currently rebuilding my bike now.